InC - Look out for these upcoming movies this coming November and December! Home / Everything Else: Article / Look out for these upcoming movies this coming November and December! Look out for these upcoming movies this coming November and December! 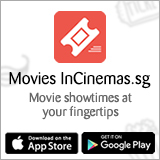 In 2018, mm2 Entertainment has released 27 feature films in Singapore cinemas, including 21 acquired and 6 mm2 original films produced in Southeast Asia. The mm2 Malaysia produced film 'Shuttle Life' was nominated for two awards at the 54th Golden Horse Awards and won awards at the 20th Shanghai International Film Festival and the 12th Chinese Young Generation Film Forum Awards. The mm2 Hong Kong produced horror film 'Buyer Beware' along with our local made films, 'Wonderful Liang Xi Mei', 'The Big Day' and '2359: The Haunting Hour' all had strong showings at the box office. Ending off this list is the highly-anticipated local horror comedy 'Zombiepura' which has just opened in cinemas on 25 October. By end 2018 and early 2019, mm2 Entertainment will release another 11 movies and end its 10 years anniversary on a high note. Audiences can look forward to 4 award-winning/nominated original mm2 films, 3 horror films from Taiwan/Thailand/ Indonesia, 2 action films from Korea, a Taiwanese coming-of-age campus comedy and a Golden Horse Awards nominated China film. The happiness of a family is shattered when their father dies a sudden violent death after spitting up broken glass. The mother becomes paranoid and fearful that strange spirits are haunting her. Meanwhile, the village shaman dies mysteriously and his house is burnt to the ground. To prevent history from repeating itself and to save their mother, the children Andi and Dina must investigate these strange events. The Rope Ritual is a traditional ritual passed down from thousands of years ago. Legend has it that after people commit suicide by hanging, a curse resides on the rope which grows more powerful and sinister over time. Along the coastal areas of Taiwan, a ritual must be performed to burn the rope to lift the Rope Curse. This is called The Rope Ritual. Jia-Wei works at a TV station and makes side income through live broadcasting bizarre events. With his good friend, A-Gwai, they decide to livestream the Rope Ritual to reach more viewers. Unknowingly, they find themselves tied to an unknown and unspeakable horror, which also implicates Jia-Wei’s girlfriend, Shu-Yi. As the situation escalates, Jia-Wei seeks the help of a Taoist Master to protect himself and his lover. But what he uncovers is Shu-Yi’s long buried secret from a decade ago. Can Jia-Wei unravel Shu-Yi’s secret and hold back the evil unleashed by The Rope Curse? Adapted from Taiwan's popular novel of the same name, it tells the story of Dragon Li who makes a bet with his buddy Wang that they will never become lifelong bachelors. Unfortunately for Dragon, he has five older demanding sisters who have made it their life’s goal to stop their brother’s love life. When a new girl joins his class, Dragon will stop at nothing to make her his girlfriend to escape the clutches of his sisters. After the passing of her sister, Yuan Zhilan attends a class reunion in her place, and reunites with her high school sweetheart, Yin Chuan. As old memories are evoked, Zhilan and Yin Chuan begin a correspondence through letters that travel through different contexts and times. Last Letter is Japanese auteur’s first Chinese language film and has been nominated for three awards at the upcoming 55th Golden Horse Awards – Best Leading Actress, Best Supporting Actress and Best Original Screenplay. Dong-Chul and Ji-Soo are a happily married couple. Dong-Chul was a notorious gangster, but has since changed his ways. One day, Dong-Chul comes home to find everything in disarray and his wife missing. Dong-Chul receives a call from a stranger with a lucrative offer to give up his wife. But Dong-Chul will never let her go. Produced by mm2, Akanga Films Asia, France's Films de Force Majeure and Volya Films of the Netherlands, A Land Imagined won the the prestigious Golden Leopard at the 71st Locarno Film Festival in Switzerland. The film also clinched the first prize at the festival’s Junior Jury Awards, plus a Special Mention from the Ecumenical Jury. In addition, independent critics presented A Land Imagined’s lead actress, Luna Kwok, with the Boccalino d’Oro Prize for Best Actress. Recently, 'A Land Imagined' also won the Gold Star for Narrative Film at El Gouna Film Festival. Set in industrial Singapore, police investigator Lok must find missing migrant worker Wang. Wang suffers a worksite accident and is anxious about repatriation. Unable to sleep, Wang starts frequenting a dreamy cybercafé at night. Hoping to find human connection in this alienating foreign land, Wang forms a virtual friendship with a mysterious gamer which takes a sinister turn. When Wang suddenly disappears, Lok digs deep into the trail that leads to a land reclamation site. Beneath all that sand is the truth. Produced by mm2 Taiwan, More than Blue had its the world premiere at the 23rd Busan International Film Festival in the "Open Cinema" category. The film is a remake of the 2009 Korean film of the same name starring Kwon Sang-woo and Lee Bo-young. More than Blue follows a terminally ill man's sad love story. K and Cream are high school classmates who live together, but never become lovers. Diagnosed with leukemia, K is hesitant to reveal his illness because he does not want to hurt Cream by leaving her alone after his imminent death. K closes his heart to Cream and arranges for her to meet another man. On the day of the 2024 U.S. presidential election, Ahab and his team of elite mercenaries embark on a secret CIA mission to abduct North Korea's Armed Forces Minister in an underground bunker below the Korean DMZ. However, they get caught under a crossfire that threatens to take the mission to the brink of the Third World War. A mm2 and Reservoir Production film, based on director Quek Shio Chuan’s true personal story with his autistic brother. Autistic man Wen Guang is often misunderstood as he suffers from attention deficiency disorder and struggles with social interaction. He also finds it difficult to perform day to day obligations. Guang starts looking for a job after being coerced by his younger brother to find one to make ends meet. But Guang’s true passion is to find the one glass that will bring him that one pure, fleeting moment of joy. 'Guang' won four awards in fourcategories – Best Film, Best Director, Best Actor, Best Actress – at the Shanghai International Film Festival (SIFF) Asian New Talent Awards. The film also won the Kumamoto City Award at the Focus on Asia Fukuoka International Film Festival. At the 13th Chinese Youth Image Forum, Guang was nominated for three awards, winning the Best New Director and the Best New Actor award for Kyo Chen’s portrayal as the autistic main character Wen Guang. A co-production by mm2 involving Taiwan, China, USA & France, and winner of the Platform Prize at the 2018 Toronto International Film Festival, 'Cities of Last Things' is the devastating portrait of a man which unfolds—in reverse—via three women who each play a pivotal role in his identity. A production that spanned eight years, Cities of Last Things marks Ho’s triumphant return to cinema after his daring, audacious debut feature, Pinoy Sunday. 'Cities of Last Things' is also the opening film of the 29th Singapore International Film Festival. To stay up to date of mm2's film releases, check out their Facebook page.